Sansons Cottage is ideally located in Leysbourne, on Chipping Campden's High Street. 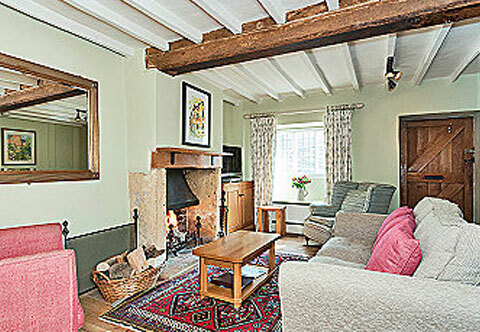 This Cotswold cottage is Grade II listed, full of character and is about 180 years old. There are exposed timbers and beams throughout. Public parking spaces in the street outside the cottage. Sitting Room - open plan, with exposed beams and timbers. Oak flooring with large rug. Guests can relax in front of the log fire on the comfortable armchairs or two-seater sofa or watch the comings and goings of Campdens high street from the window seat. 32" Sony flat screen TV with Freeview and DVD player. Bose ipod dock. Pure digital radio. An attractive kitchen/diner with fitted cupboards, washing machine / tumble dryer, microwave, undercounter fridge with freezer compartment. Stainless steel Neff gas hob with electric oven and extractor fan. An ironing board and iron are provided. Small pine table to seat four people. Bedroom two - Attractive double bedroom (5' bed) with a window seat overlooking the High Street. Exposed floor boards and rugs. Craftsman built fitted cupboards, bedside tables and chest of drawers. Television with Freeview and built in DVD player. Bedroom one - An old door leads from the middle floor (first floor) landing, up the stairs and straight into Bedroom One on the second (top) floor. A lovely spacious high ceiling attic bedroom with exposed beams. The King Size (6ft) bed is zipped and linked and can be made into two, 3ft twin beds if required. Craftsman built fitted cupboards, bedside tables and chest of drawers. Hairdryer. Television with Freeview and built in DVD player. The garden steps at the rear lead up to a narrow gravelled path, which wends its way through the lovely "cottage garden". At the top of the garden is a patio area where there are wooden chairs and a table where you can sit and relax. There is a D.I.Y barbecue.